In prehistoric times, a legendary figure known as Shennong was said to roam the dense forests of Hubei province, searching desperately for medicinal herbs and remedies to add to his repertoire. His quest to provide healing poultices to the common people led him to eat hundreds of different plants each day, resulting in him becoming poisoned over 70 times. You could almost say he had a toxic relationship with the botanical world! The name “Shennongjia” literally translates to mean “Shennong’s Ladder”, in reference to the rattan ladder that he would use to climb up and down the mountains. Shennongjia Nature Reserve is located in Shennongjia Forestry District, the only district of its kind in China. Its biodiversity, abundance of rare plant and animal species, and beautifully preserved virgin forests meant it was designated a UNESCO World Heritage Site in 2016. Covering a colossal area of over 3,200 square kilometres (1,235 sq. mi), it is more than twice the size of the city of London! Thanks to its mountainous landscape and deep valleys, the reserve encompasses three climatic zones: subtropical, warm temperate, and cold temperate. This means that it can support a wider variety of plant and animal species, resulting in the unique diversity of its inhabitants. The reserve boasts over 3,400 types of plant, including 26 rare and 33 indigenous species. Over 490 species of animal populate the reserve, many of which are heavily endangered and under state protection, such as the golden snub-nosed monkey, the golden eagle, and the giant salamander. For unknown reasons, the reserve supports an uncommon number of albino residents, with albino bears, deer, squirrels, snakes, and even crows being spotted throughout its expanse. But all of these curiosities pale in comparison to the strange creature that some locals would have you believe is hiding in the forests. Like the Himalayan Yeti or the American Bigfoot, Shennongjia Nature Reserve is rumoured to be the home of the dreaded Yeren or “Wild Man”. This ape-like beast is said to walk upright like a human, be over 2 metres (6 ft.) tall, and is covered in shaggy red or brown hair. Since the 1970s, there have been several sightings of the Yeren, although thus far it has never been clearly photographed or caught. Hikers beware, the Yeren has a preference for mountainous terrain and is evidently an expert at hide-and-seek! There are plenty of places for it to live and hide, since the reserve itself is part of the Qinba Mountain Range. Its highest peak, Shennongding, towers in at 3,105 metres (10,187 ft.) above sea level. With an average altitude of 1,700 metres (5,577 ft.), the mountains of Shennongjia are often referred to as the “Roof of Central China”. Based on the various attractions within the reserve, it is usually split into four sections: Shennongding Scenic Area in the southwest; Yantian Scenic Area in the northwest; Xiangxi Source Scenic Area in the southeast; and Yuquan River Scenic Area in the northwest. 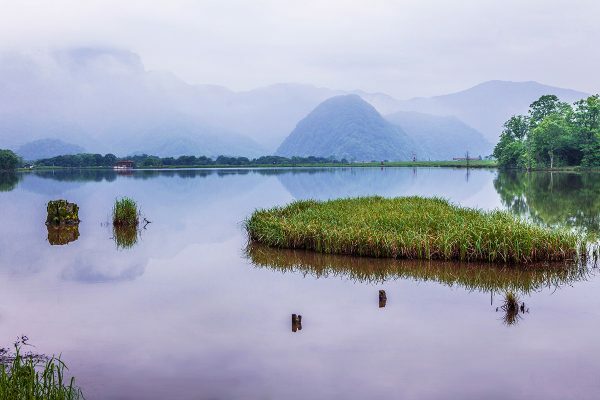 Alongside Shennongding Peak, the Shennongding Scenic Area is home to a plethora of hidden gems, including the glittering Dajiu Lake and the accompanying wetlands beneath Yagao Mountain. It is also inhabited by members of the Tujia ethnic minority, who delight visitors with their vibrant customs and rich folk culture. Yantian Scenic Area is an emerging eco-tourism destination, with the valleys of Tianmenya, Yanziya, and Hongping forming the core attractions. They are renowned for their misty peaks, lush foliage, pristine waters, and dizzying cliffs. An ethereal sea of clouds blankets the landscape, giving the impression that one has entered a fairy-tale world. Xiangxi Source Scenic Area is so-called because it is located near to the source of the Xiangxi or “Fragrant” River. Alongside its apparently beguiling aroma, the waters of the river are also said to contain 14 different kinds of minerals and have special nourishing properties. Historical figures such as Wang Zhaojun, one of the Four Great Beauties of ancient China, and Qu Yuan, a famous poet of the Warring States Period (c. 476-221 BC), were said to visit the river specifically to drink its water. Other highlights of the area include Shennong Altar, a 21-metre (69 ft.) tall statue to commemorate Shennong, and Laojun Mountain, which was named after the founder of Taoism, Laozi. Yuquan River Scenic Area is similarly based around the Yuquan or “Jade Spring” River and is particularly popular with more adventurous tourists, since it features high mountain peaks, deep valleys, and sprawling lakes. The area also contains its own museum, known as Shennongjia Eco-museum, where visitors can learn about the mysterious Yeren and admire some of the fossils that were found in the nature reserve. During each of the four seasons, the Shennongjia Nature Reserve transforms into a wonderland of new and exciting scenes. In winter, the mountains are capped by snow and glistening icicles cling to the rock-face. Spring breathes life into the meadows with colourful rhododendrons, cherry blossoms, and all manner of wildflowers. By summer, the sun-baked earth has turned a golden brown and the vibrant greens of the trees shimmer in the bright sunlight, while the rich orange and yellow hues of autumn, though more muted, are no less magnificent.